In this links you can view/download pdf the guides La Orotava with all the information on this itinerary : history, maps , links , and so on. The Great Tapestry of the Town Hall Square about 900 square meters and natural sands of Teide National Park is inspired this year’s Mercy, in addition to tribute to Refugees. La Orotava (Tenerife North) celebrates its big day on Thursday June 2 2016, with the celebration of the Infraoctava of Corpus Christi and Day Carpets, since the early hours of the morning after the traditional ringing of bells and the celebration of the Eucharist at seven o’clock with alfombristas begins making floral carpets and corridos in the streets of the historic center – College Carrera Escultor Estevez, Tomas Perez and Inocencio García-by will be done in the afternoon the route of the Blessed Sacrament. A total of 36 carpets made by groups and families of the Villa as is tradition (specifically about 20 tapestries, 15 calendar, plus the grand tapestry of the Town Hall Square). In this sense remember that the history of the carpets of La Orotava dates back to 1847 when some members of the Monteverde family, under the inspiration of Leonor del Castillo, made a carpet of flowers to celebrate the passage of the Andas of Corpus front of his private house. The only material used in these tapestries street, authentic works of ephemeral art, are flowers, petals, plant material and much chopped heather is used to upholster the margins of the road. 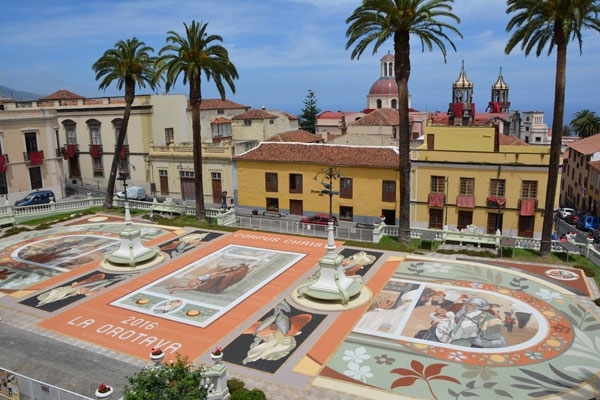 The square meters of road covered are about 5,500 m2 and it is estimated that more than 1,000 people, adults and children participate in making these carpets, of which 500 are members of the Association of Alfombristas Villa de La Orotava, and other collaborators friends. 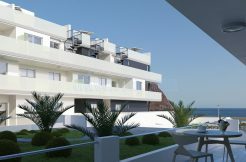 The villeros alfombristas work from months earlier in the design and development of the sketch. A few days before the holidays large quantities of flowers of all kinds are brought, and the process of defoliation begins flowers, work done especially women of the village. This year it has nearly a thousand boxes. Among the multicolored flowers used no roses, chrysanthemum, carnation, marigold, flower world, silver flower, geraniums, daisies, brooms, retamón, evergreens, cruets, veroles, MILTON, violets. The Aresta is the name used to call the tiny leaves of the heather. They are used in three colors: green, brown and black. To remove the shade of black is required roasting at a high temperature and burn out before so they do not become ashes. It is a thankless job and unheralded, but necessary. This process usually takes three weeks before the holidays. The smell permeates clear throughout La Orotava, which announces that the holidays are coming. 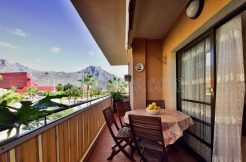 Throughout the process leading carpet weaving, it can be said that the art of floral carpets of La Orotava is the most sublime expression of religiosity and creative spirit of the slum dwellers. Thus, the Corpus Christi has become a sign of identity of the Villa de La Orotava, and has international projection. A month working on the construction of the Great Tapestry of the Town Hall Square made with volcanic sand from Mount Teide National Park, a World Heritage Site. The total area of the square is 950 square meters, being usable to cover with land 920 square meters. black, white, yellow, red, green, violent, brown, gray … All but the blue: 20 natural colors are currently used. The volume of land used is about 1,350 kg. The alfombristas teachers spend more than 2,000 hours in this unique craftsmanship. 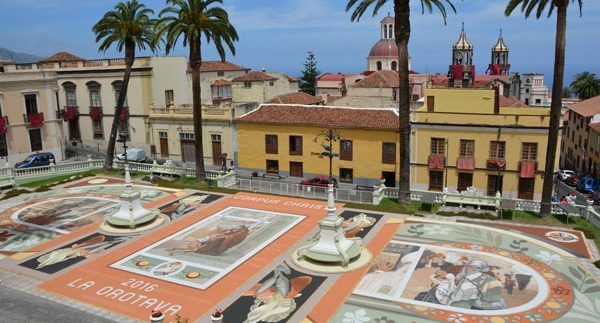 On February 11, 1905, with the occasion of a tribute to the Navy League- was executed in the Plaza del Ayuntamiento the first carpet, the central part was occupied by the shield of La Orotava and a caption that said “To our Navy “. Two anchors, two oars, two lifeguards and the names of the ships” Pelayo “and” Carlos V “. and in March 1906 with the visit of king Alfonso XIII La Orotava is again made for the second time another in this square and also with flowers. and in 1912, already paved and finished the square, when the Corpus Christi procession made station in it. Here displayed their personality famous alfombrista Felipe Machado and Benítez de Lugo, already known . tapestries in the theater square your carpets began covering virtually the entire campus, and work began a month earlier with the rarest natural ingredients, land of different colors, dates, fruits of eucalyptus, bits of straw, vegetables, etc. . elaborated the most delicate ornamental motifs of the tapestries, and every year sorpredía the originality of their creations. Later they were phased out natural products tapestry of the Town Hall Square and passed to confeccionarse with land taken from the most remote places of the Canadas del Teide, which make their colorful and extraordinary beauty is the greatest art form of the solemnity of Corpus Christi, and causing the admiration of the many visitors who annually flock to La Orotava to look at the tapestry, which becomes its own island colored teideano made offering. Was the architect Thomas Machado and Menendez Fernandez de Lugo, grandson of Felipe Machado, who in 1940 gave the monumental tapestry of the Plaza del Ayuntamiento full extent currently occupied, as well as volume and new perspectives in which it is perceived and an serious attempt combination of light and color, which printed the art of carpets new directions and guidelines, constituting a magnificent work of artistic inspiration. Pedro Hernandez Mendez continued the work with excellent resources and dominating the technique of drawing and perspective, made between 1947 and 1976 creations of high aesthetic value. He used six natural colors combined with a perfect pictorial technique and also used variety plant products of the island. Then José González Alonso, helped by his sons, made for several years the tapestry with natural lands, achieving once again the admiration of thousands of visitors annually flock to La Orotava to watch the wonderful spectacle. And also achieve remarkable artistic admiration Ezequiel de Leon Dominguez, whose son is now one of the great masters in the Plaza. For 25 years alfombristas twenty working in the grand tapestry, directed by Domingo González Expósito. In 2007 they received the Guinness record as the largest land tapestry of the world. The art of rugs the Villa de La Orotava because of its famous Festival of La Orotava in honor Stmo. Corpus Christi is not only the expression of religious and artistic spirit of a people, but an entire annual events whose fame exceeds the entire archipelago and Spain. La Orotava carpets have won, deservedly, internationally renowned. Mercy and social reality is the inspirational theme of this carpet for the festivities of the Corpus Christi Infraoctava 2016. The design is classic yet modern couple. This edition has a strong social content in order to sensitize everyone to behold on the problems of people who are, in addition to assessing the need for teaching and education as essential for social equality values suffer. The classical part is represented in the central carpet with the theme “The Return of the Prodigal Son”, designed by the Spanish painter Bartolome Esteban Murillo. The format of straight lines and a vertical space (like script spirituality) between lampposts, reminds us of the first carpets. This space is in front of another major lilac that includes other 4 spaces that form the border of this central carpet. These 4 flowers, visually form a cross that brings us back to the central theme sight. It also includes the usual text of Corpus Christi La Orotava 2016, in this central space, but the importance of reinforcing Mercy repeating this word as part of a simple border around the space Salmon. The modern part of the carpet is observed on the sides, both for its subjects marked social character as for their shapes, circular shapes are defined in the continuity of the four major central flowers, also intuiting this year, the symbol of infinity. In the tapestries on the left side it represented the missionary sister Angélique Namaika, award fraternity 2013, teaching and educating to thereby assist in the search for equality of all human beings and break and overcome the barriers that separate us and that discriminate against many people. In the tapestries on the right side: an anonymous scene refugees, strangers who have nothing and do not know where to go. And in the narrow vertical tapestry that figure is next Pope Francisco opening the door “Mercy” Santa Maria Maggiore; in a gesture of action against the serious problem of refugees, encouraging this gesture to all social strata to seek urgent solutions. Thus the Great Tapestry transmits a message to each person to be able to act in the best of their abilities and aptitudes address the serious social problem in the world.